I have a video overview for all of this now, too. Writing code for multiple platforms can be a lot of work. It can be even more work to have to completely rewrite it for each one, too. 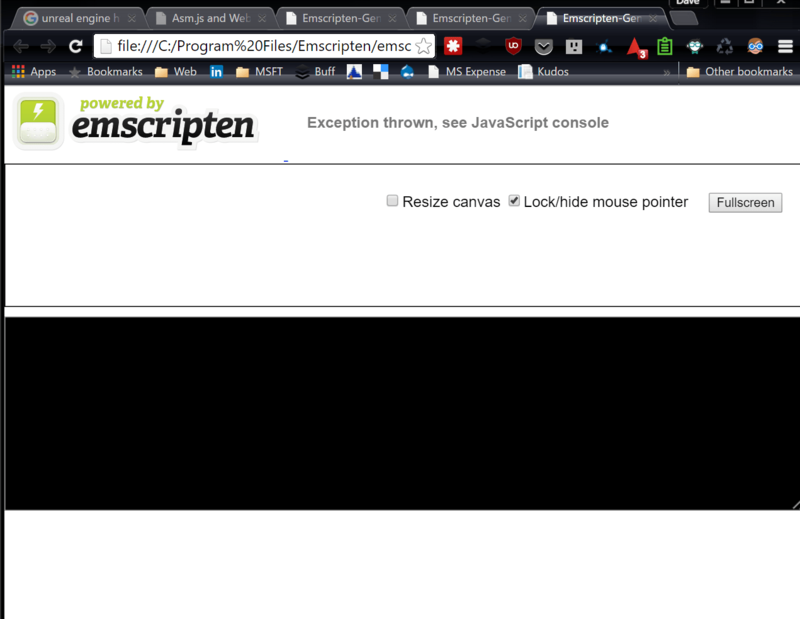 What if you wrote an application in C++, but wanted it to be displayed in the browser somehow? Well now, with a tool called Emscripten, that’s possible. I previously wrote a blog post illustrating what Emscripten is, and how it works in relation to some of my favorite game development tools: Unreal Engine 4 and Unity. 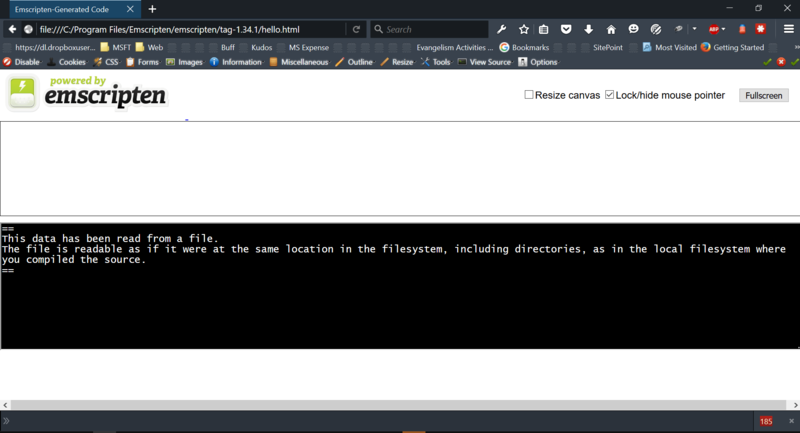 Therefore, I won’t go into great detail about how it works here, but instead wanted to focus on creating your own web project which takes advantage of Emscripten, so that you can take C / C++ code and get it running inside of the browser. I had initially considered not writing this tutorial, but when I ran into so many issues with the installer, I thought it would be helpful to others. I looked at how Epic recommended it for exporting projects from UE4, and they suggested to use the SDK Web Installer. This led me down a rabbit hole. I was hoping that the installation process was going to be smooth, but I spend nearly two days trying to get Emscripten working correctly on my machine before having any success. The team has fantastic getting started instructions on the site, but if you pick the wrong installer, you may be in for some trouble. My first issue was that I chose to go with the Web Installer. This is not the installer you are looking for. Instead, use the SDK Offline installer, and you’ll have smooth sailing and it should only take you a few minutes. 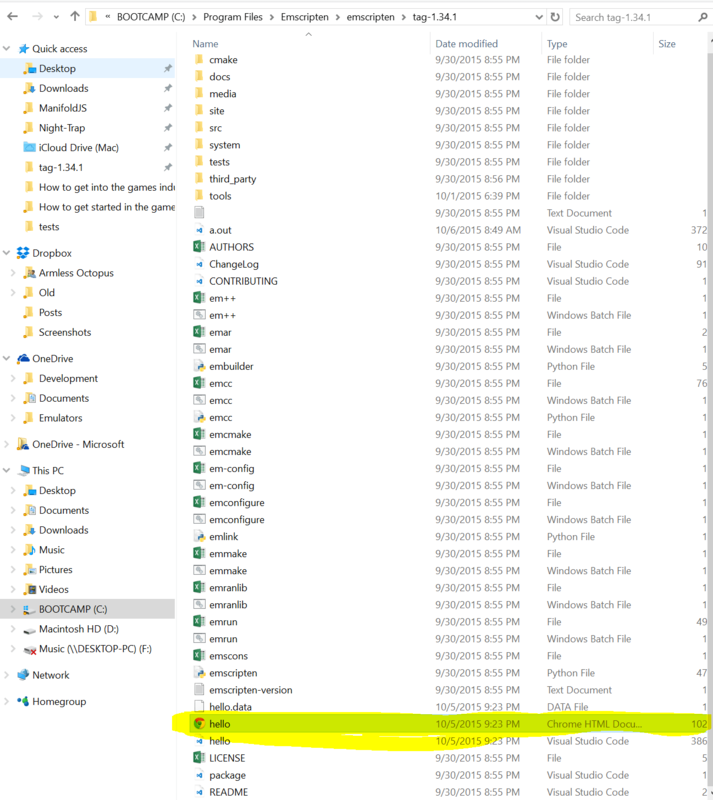 There are a number of bugs with the Web Installer, particularly around the various versions of Visual Studio that you have installed. This is a known issue, but it is being corrected. I believe it has to do with the parallel optimization that Emscripten is doing behind the scenes, and I found that the Cmake was pointing towards the latest version of Visual Studio (2015 community) that I had installed, and not VS 2010, which is what Emscripten was requiring. 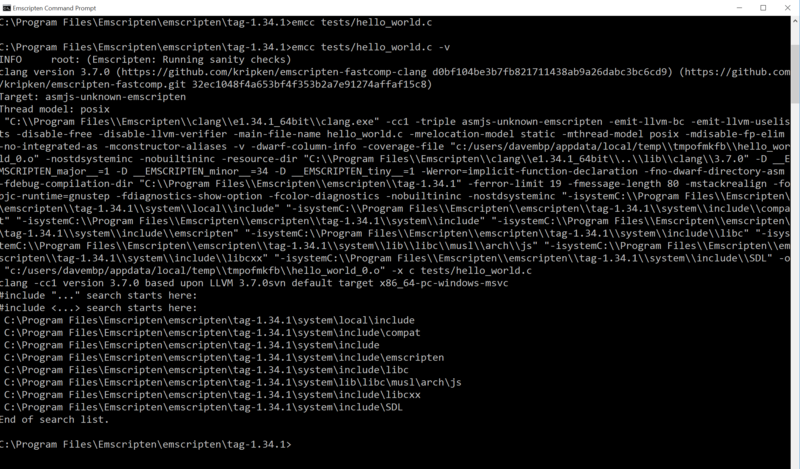 You can use Emscripten from Visual Studio, but I found it easier just to perform my builds from the Emscripten CLI. If you did want to use Visual Studio, the instructions can be found here, although only VS 2010 and 2013 are supported at the moment. 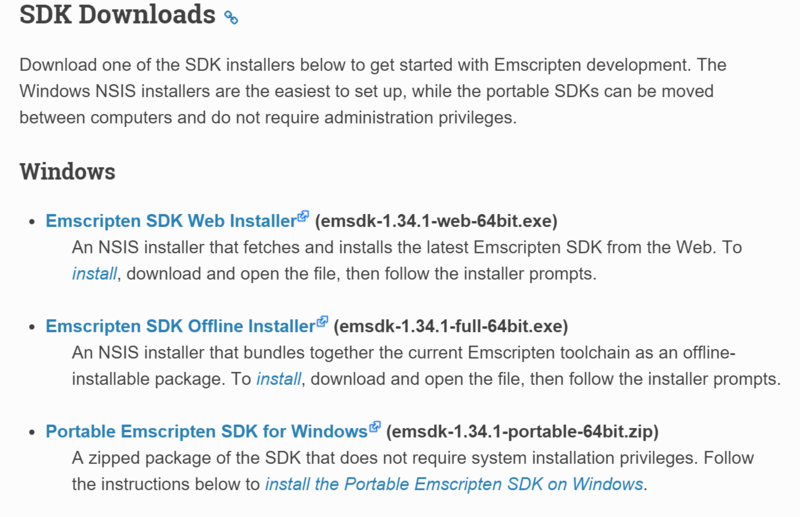 The Emscripten SDK provides the whole Emscripten toolchain (Clang, Python, Node.js and Visual Studio integration) in a single easy-to-install package, with integrated support for updating to newer SDKs as they are released. Run the Emscripten Command Prompt to get started. I generally hit win + ems and it appears. You’ll be greeted with the CLI, and will begin at the location where you installed Emscripten. # Set up the compiler configuration to point to the "latest" SDK. 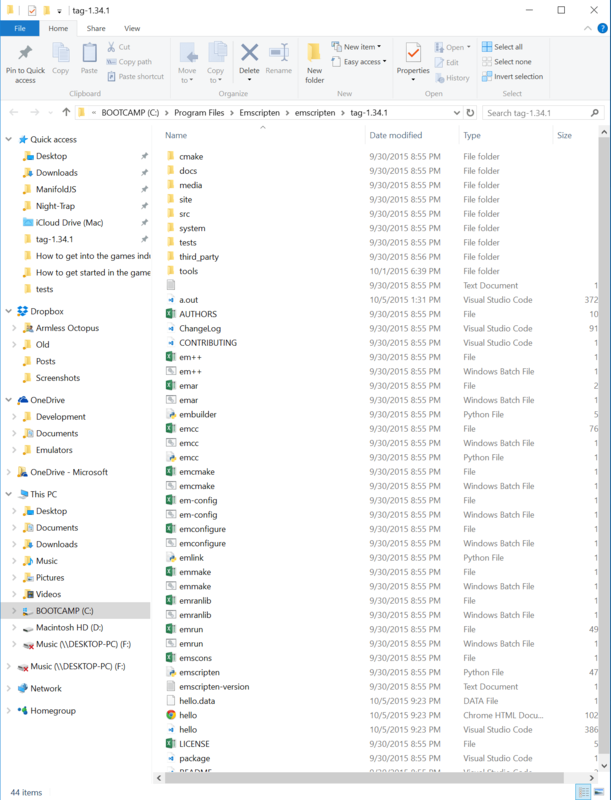 UPDATE: You may not have a “tag” folder. That’s fine. In going over this again today (2/2/16), the latest update to the SDK simply says 1.35.0 and has no mention to tag. For this demo you only need to navigate to the latest version that you have installed. Tip: At any point you can enter ‘explorer .’ into the CLI to open the explorer folder and better visualize what you’re looking at. For folders which have dozens of items, this can often be easier than typing ‘ls’ to list everything in the directory. If it all went well, your CLI should pause for a moment, then return to the same location. What’s going on here? Well the compiler wasn’t very verbose about giving us any sort of feedback, so let’s add that now, to get a better understanding of what’s happening behind the scenes. We’ll add the ‘-v‘ argument to our command, to make the compiler spit out more verbose information. All this did was compile our application to C, and create an a.out.js file in our current directory. If you prefer to use C++, you could use ‘em++’ instead of ‘emcc‘. That’s great, but I want to see something in my browser. <name> .bc : LLVM bitcode (default). <name> .o : LLVM bitcode (same as .bc). We are telling Emscripten to use the C compiler to look into the tests folder for the file hello_world.c and then output it as hello.html. Inside of your C:Program Files Emscriptenemscriptentag-1.34.1 folder you should see hello.html. But let’s step it up a notch. I want to read from a file and serve some content. Let’s move to the hello_world_file.cpp as our final part of the tutorial and read a file, as this will cover several parts I wanted to discuss, including how to serve the content. Now try opening that same hello.html file again and see what happens. But in Chrome and Edge, we don’t have as much luck. This is because those browsers do not support file:// XHR requets, so local files with preloaded data can’t be loaded. We need to spin up a webserver. We already have python installed, as it is part of the emscriten package, so let’s spin up a simple server from our current directory and try this again. And there we go! Serving HTML in the browser, from what was previously just C++. Using direct function calls (faster but more complicated). As function pointers from C.
Using the Embind val class. It’s out of the scope of this tutorial, but I will cover it in a future one. In the mean-time, check out the Emscripten docs on the topic. There are also bits of code which are known to compile, but run with performance issues. Notably, 64bit int variables. Mathematical operations are slow because they are emulated, but the inclusion of SIMD (Single Instruction Multiple Data) should help with this in the near future as browser adopt it. This page on portability guidelines can offer more info. I didn’t want to dive too deep with this today, but in my next tutorial for the series, I’d like to cover some more complicated examples, which take advantage of SDLib, as well as a middleware tool such as Unreal Engine 4 or Unity, so that we can see how asm.js really performs in the browser.